Calling all agents – the President needs you in Code Name: S.T.E.A.M., only for Nintendo 3DS family systems! Take control of a squad of super-agents, fight off aliens aplenty and strike up a win for the history books in this turn-based strategy shooter! It’s the late 19th century, and steam rules the world. Due to advances in technology, steam now powers airships, telecommunications, weaponry, and everything in between. It’s truly an age of wonder – until aliens burst onto the scene, intent on invasion! Chaos descends on the once tranquil world, and as the situation reaches boiling point, President Abraham Lincoln forms S.T.E.A.M., a group of brave souls who are fuming and ready to fight back! Enter combat with a four-strong squad. Plan your strategy turn-by-turn and tread carefully around battlefields filled with dangerous enemies. There’s no overhead map to refer to; you can only see what your agents can, so seek out vantage points to give yourself a better look at the battle and identify enemy positions. Your every movement and attack is fuelled by steam power, so don’t steam ahead, and think thoroughly before you fire. Stay safe in cover until you’re ready to go into action, and try to keep some steam in your tank to launch counter-attacks during enemy turns. Go full steam ahead against other players in local and online Versus multiplayer. Think on your feet in fast-paced battles, where the player who collects the most medals or defeats every member of the opposing team is the winner, or do battle in gigantic A.B.E. robots, inspired by the President himself! You can also prove you’re a global superpower in public and private tournaments. By using selected amiibo, you can bring Fire Emblem heroes into the battle! These unique characters fight using Fire Emblem-related weapons and Special Attacks – but if they fall in battle, the only way to revive them is to tap the amiibo again. 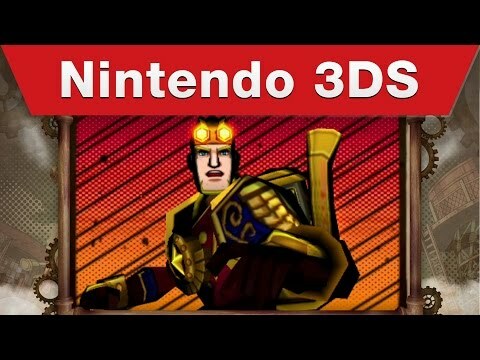 Stand up and be counted in Code Name: S.T.E.A.M., only for Nintendo 3DS family systems. The world is relying on you!